Perfect for carving your Sunday roast or for prepping in the kitchen, this stylish carving board features a 'moat' around the edge to collect any juices, which can then be added to a gravy or juice. 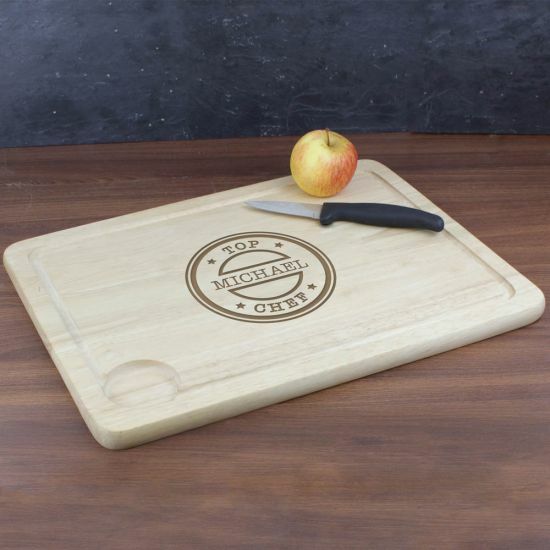 Personalise this Top Chef Carving Board with a name up to 12 characters. 'TOP CHEF' is fixed text. Hand-wash only and do not soak. Keep away from heat sources. Name will appear exactly how customer enters. Please note as the carving board is a natural wood product, colour and grain may vary from board to board. This may also cause the engraving to appear slightly darker or lighter in places, however the surface should be smooth and even. Ideal for House Warmings.